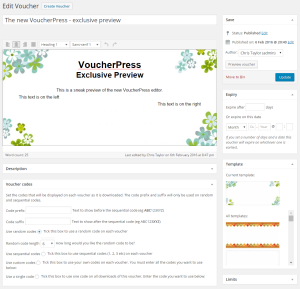 Since 2010 VoucherPress has been free to use, and I will continue to offer a free version. But there’s so much more that VoucherPress can do. 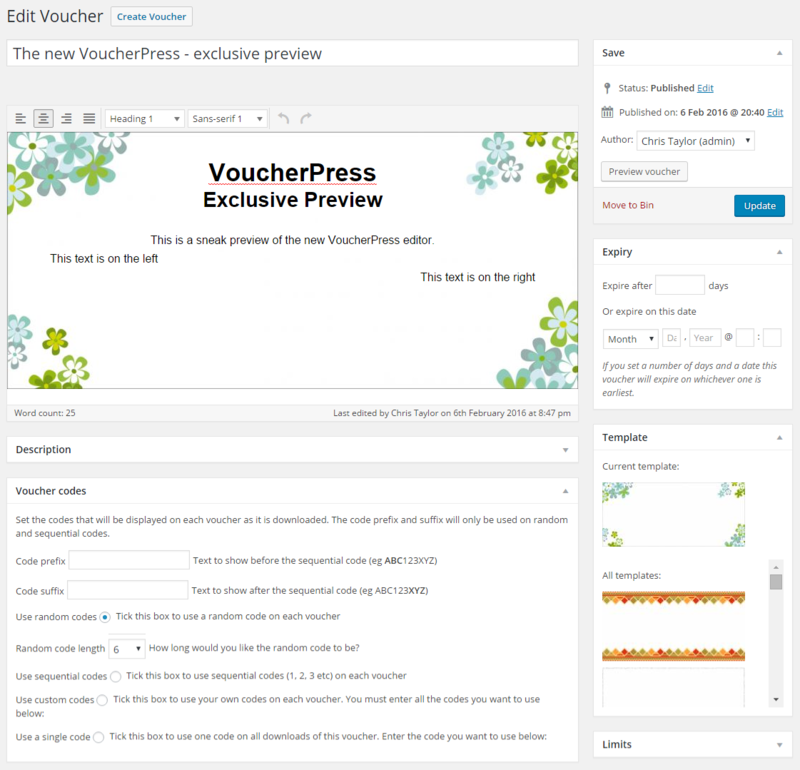 To ensure I can offer the support that you deserve – and to enable development of more new features – I’m going to introduce a range of premium add-ons that will make VoucherPress much more flexible and powerful. If you want to collect more information than just name and email address when customers register for a voucher, there’ll be an add-on for that. Or if you want in-depth stats, vouchers of different sizes, voucher collections or advanced control over exactly when vouchers are available, there will be add-ons available for all those features. Plus I have lots more in the pipeline! I’ve been working on a completely new version of the free VoucherPress plugin, and I’d love to share a screenshot with you so you know what’s coming. The layout will be familiar to you – it’s just like editing a post or page. Notice the editor is now one big box. You can enter text wherever you like, and align it centre, left or right. I’ve also cleaned up the template selector, and made the preview option more obvious. There is also a more obvious way to see the shortcodes associated with a voucher (not shown on this cropped screenshot). To know where I should concentrate my time I’d be really grateful if you could fill in the short anonymous survey below. I’d love to know if any of the premium features I have planned would be useful to you, and I’d also like to know how many people use the registration features in the current version of VoucherPress. Thanks very much for your help, I really appreciate you taking to time to help make VoucherPress better.